Roomy, tech-savvy, and customizable, the new Nissan Sentra Sedan’s interior is nothing if not a great value. Starting at $16,990 MSRP, the 2017 Nissan Sentra offers clean-cut styling and thoughtful utilities, and leaves tons of cutting-edge technologies and premium comforts waiting in the wings. Its cozy, down-to-earth cabin offers widescale appeal for drivers in Bremerton, Gig Harbor, and beyond! The interior is as accommodating as it looks with 42.5/37.4 (front/rear) inches of legroom, 54.7/53.9 inches of shoulder room, and 39.4/36.7 inches of headroom. The cabin comfortably seats five people, and includes a 60/40-split-folding rear seat, so you can transport items and carry a rear passenger. Standard on SV and SL, the Piano Black trim modernizes the cabin, and pairs beautifully with the available 370Z-inspired leather-wrapped steering wheel. NissanConnect, a Rearview Monitor, and heated front seats are all optional features, as well as NIMSO exclusives like sport seats with extra bolsters. In addition to being spacious, the interior of the 2017 Nissan Sentra is both sleek and practical. The Sentra S comes with a 6-way manual driver’s seat, Silver interior trim, air conditioning with a microfilter, power windows and door locks, and remote keyless entry and trunk release. Of course, there’s plenty of room for upgrades, such as a 6-way power driver’s seat with power lumbar support, leather upholstery, an auto-dimming rearview mirror, and Intelligent Cruise Control. 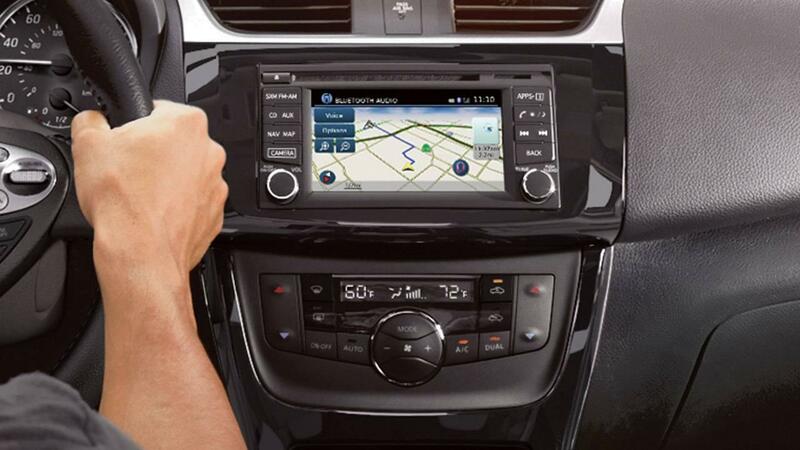 Advanced technology is another one of the Sentra’s strengths. Standard on SL, the NissanConnect system includes navigation, mobile apps, and voice recognition for hassle-free travel around Port Orchard. The four-speaker AM/FM/CD audio system lets you listen to your music on the go, and is easily controlled through the available 5.0- to 5.8-inch color display. Audiophiles are sure to appreciate the optional Bose Premium Audio System with eight speakers and two subwoofers. Schedule a test drive at Advantage Nissan in Bremerton to experience the 2017 Nissan Sentra’s interior first-hand. Our talented sales and finance team will help you choose your trim and get back on the road!